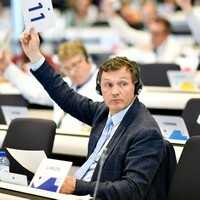 Olga Zrihen, the vice-president of the Belgian senate and a member of the Walloon parliament, has been chosen by Europe's regions and cities to champion policies that strengthen local economies. The United Kingdom and the European Union should be aiming for an "ambitious agreement" that enables a "genuine and continuous partnership" after the UK ceases to be a member of the EU, a delegation from the European Committee of the Regions (CoR) told Northern Irish politicians on 23 May at a meeting focused on the implications of Brexit on the peace process, business, and cross-border cooperation on the island of Ireland. Leaders of the European Union need to step up their support for cities and regions dealing with the large numbers of refugees and migrants and to recognise that European cities and regions contribute to the management of migration beyond the EU's borders, the President of the European Committee of the Regions (CoR) on 21 June told a high-level conference on migration hosted by Antonio Tajani, President of the European Parliament.